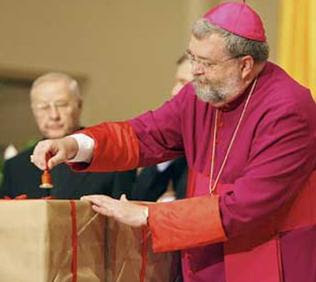 on February 2, 2008 in the Peoria Cathedral. On Sunday, September 9, 2012, at 10:30 am Bishop Jenky will celebrate a Mass of Thanksgiving to honor Venerable Fulton Sheen in the Cathedral of Saint Mary, Peoria, IL — the same cathedral in which Venerable Fulton grew up, received his vocation to the priesthood and was ordained. You are invited to this historic celebration. There will be a holy hour from 9am to 10am and the Mission Rosary will be recited at 10am. More importantly, you can spiritually share in this celebration. Send your intentions to the Foundation and your prayers will be presented during the Offertory. Visit ArchbishopSheenCause.org for more information.